The team’s fortune improved under the guidance of George Woodruff, a student in Penn’s law school who began coaching the team in 1892. He invented many new techniques and plays, and implemented ideas developed by others that had previously existed only on paper. Prior to his arrival, Penn’s coaches had focused on building their team’s strength and endurance, aiming to win games by brute force. According to historian Dan Rottenberg, Woodruff added the element of deception, hoping to counter Penn’s perennial lack of heavy players by focusing on agility, speed, and confusion. His strategies went contrary to the norms of the day, and concentrated on an active defense whereby the defense charged early, and in which the normal roles of the team’s members were switched so that the opposing team could never predict which players would tackle and which would block. Interestingly, John Heisman, a Penn varsity football player in 1890 and 1891, completed his law degree and left Penn just before Woodruff’s arrival. Like Woodruff, Heisman emphasized strategy. Heisman, again like Woodruff, went on to become a successful football coach (including a stint at Penn from 1920 to 1922) and was well-known as an innovator in the sport and as a primary shaper of the football rule book of his day. The Heisman trophy would be named in his honor. 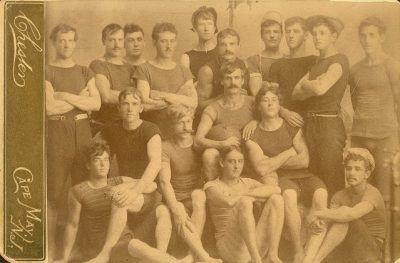 Woodruff’s first year of coaching became Penn’s most successful to date, with the team losing only one game out of sixteen (to Yale, by a slim margin). 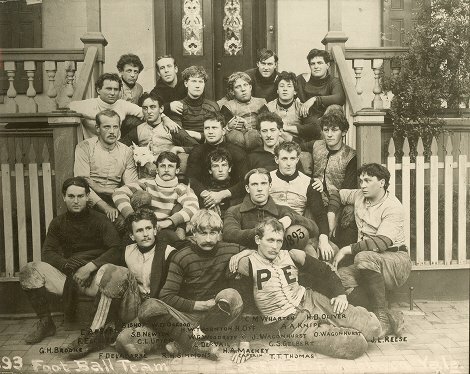 Among these sixteen wins was Penn’s first victory over Princeton, after sixteen straight years of defeats. Perhaps in response to this turnaround, the Intercollegiate Football Association soon passed rules providing that no “member of a graduate department, nor special student, should be allowed to play [football for a University or College]” (Athletic Association History). The avowed intention behind the change was to prevent colleges from padding teams with professional players; however, the practical effect was to penalize larger Universities, since they drew mainly on graduate students to fill their teams. Smaller colleges such as Princeton or Yale were mostly unaffected by the changes, since they had no graduate students. Since graduates students made up a large fraction of their enrollments, Penn and Harvard recognized that these changes would affect them more than other institutions. Both institutions protested the changes, claiming that the new rules would be both unfair and ineffective. They proposed an alternative set of rules, focusing on the recruitment of players from athletic clubs and small schools for major college teams. 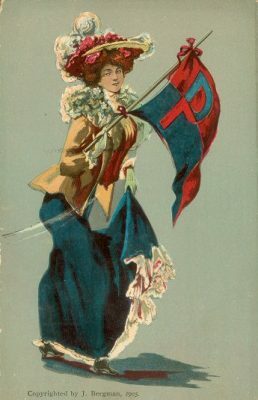 When these protests proved fruitless and the rules passed without the desired changes, both the University of Pennsylvania and Harvard withdrew themselves from the Association. Leaving the Intercollegiate Football Association did not lessen Penn’s accomplishments on the field. 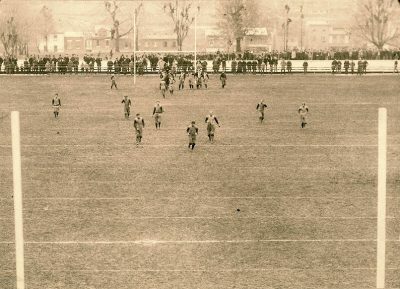 Many Association members, including Princeton and Yale, continued to play against Penn. Over the next four years, from the start of the 1894 season to midway through the 1898 season, the Red and Blue lost only one game. Often, Penn’s victories were overwhelming. 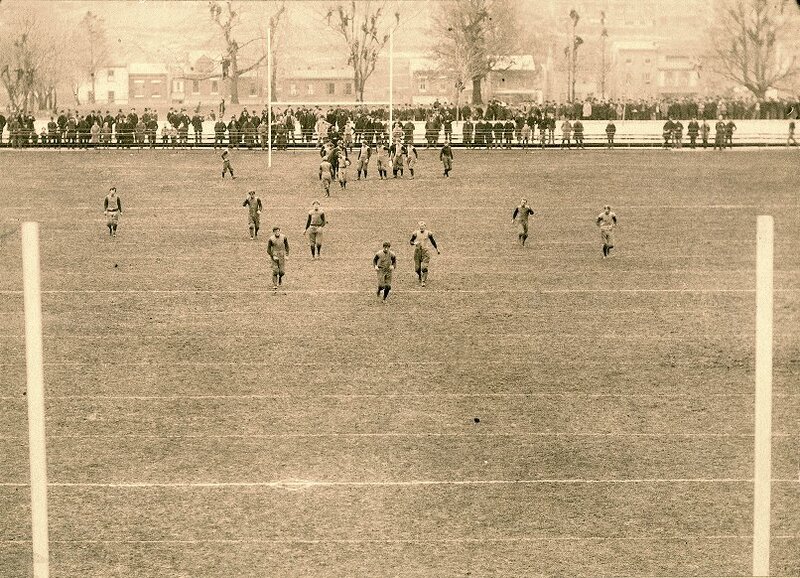 In 1896, for example, Penn was scored on in only three games; and in 1897, Penn won all of its fifteen games, scoring a total of 517 points over the course of the season (84 of them in one game against Dartmouth. Dartmouth scored zero). 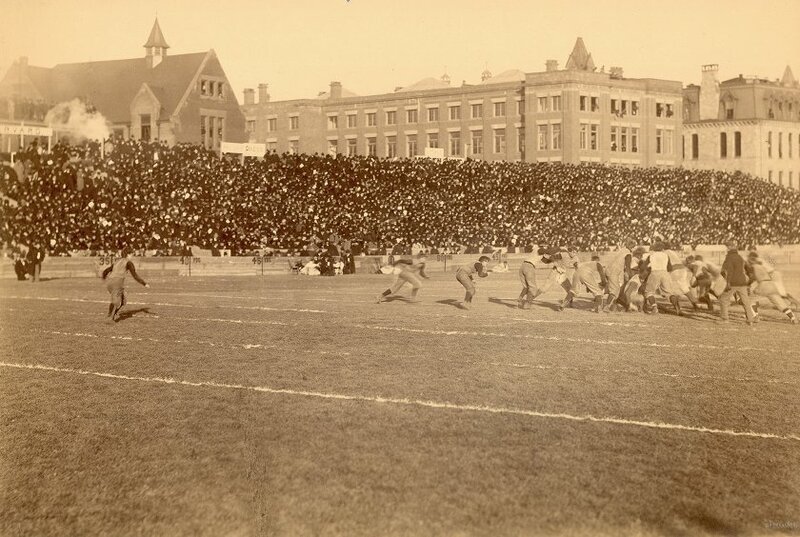 The popularity of the sport and of the Penn team soared, and attendance numbers for games grew greatly — as many as 24,000 people turned out for the Penn vs. Harvard game in 1897, then an unheard of number. The crowd was not disappointed: Penn beat Harvard soundly, 15 to 6. On the whole, Pennsylvania acquitted itself well over the next three years, 1898 to 1900, winning thirty-two out of thirty-nine games and tying twice. 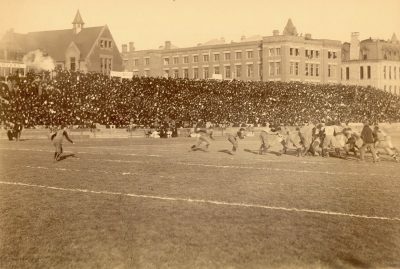 But the 1897 victory against Harvard was not repeated: Harvard won every game thereafter, and these losses were attributed to Woodruff’s coaching. Detractors said that he relied too much on a handful of plays, and that his approach to the game was inflexible. They further claimed that Woodruff’s strategies’ relied on fast and agile players, exacerbating Penn’s perennial tendency to field lighter-than-average players to the point where it became impossible to play any way but Woodruff’s way, since a traditional strategy could not work without heavier players. Thus, the argument went, Penn’s playing was predictable, allowing teams such as Harvard to devised strategies solely to foil Penn. The simplest counter-argument was that Woodruff won almost all the time; games against Harvard were the main exception. Under his coaching, the team was more successful than any prior. What more could anyone reasonably want? Another counter-argument went that it was unreasonable to blame Woodruff’s nontraditional strategies for the losses to Harvard because these same strategies were largely responsible for Penn’s successes against everyone else. Addressing the issue of predictability, others argued that Woodruff’s innovations were wonderful when successful, but that they were too often rendered unusable because the rules of football had changed. Woodruff would invent a strategy and teach it to the team, they would practice for weeks to perfect it — whereupon the strategy became illegal due to a rules change. This was an intrinsic problem in coaching during an era when the game itself was still evolving.